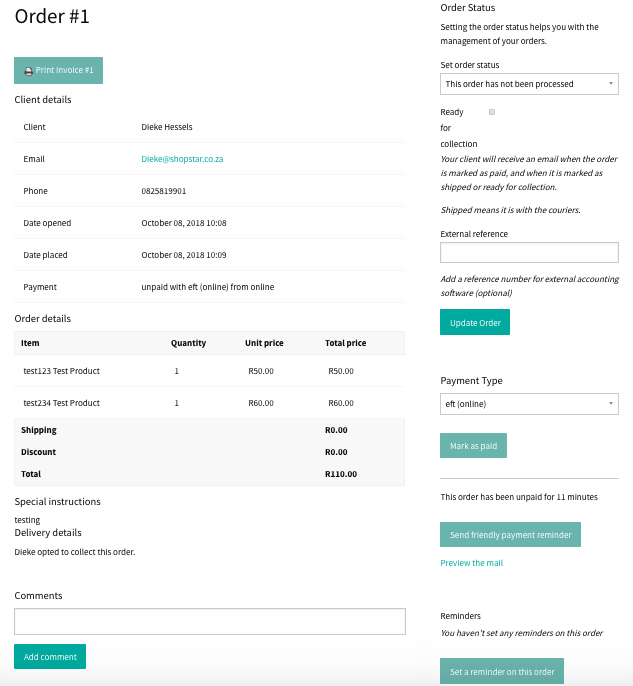 Once an order is paid for via a payment gateway, orders will show as paid on the system. If paid via EFT you can set the order as paid when you have received the money in your bank account (Please do not rely on just a POP in case of doubt). If an order has not been paid for any reason (credit card issues, banking delayed), you can follow up with an email with your customer. Orders that are cancelled will be added back to the stock. You will be able to view and manage your orders from: Orders >> Orders. This is where you see new orders come in as well. Click on 'edit' for that specific order and it will take you into the order. On the right side you have the order settings. When changing the status, the client will receive the relevant email messages that you have set up. In this section you will see an overview of any cancelled orders. There is not automatic refund or cancellation notification. If a customer cancels an order you can cancel it in the system but there is not automated email to customer. You will have to send the client one specifically and get their banking details. So, whether you have received the customer’s money via EFT or PayFast and want to refund him, you need to refund him via EFT or send a voucher code issued to the amount for a new purchase. Payfast does not refund. In this section the returns made via POS will be visible. In the POS section you will find a returns section. Click on the product that is being returned. Click on 'Create Return' and fill out the form below according to the return specifics and click on 'Return Items'. You have the ability to create a cash refund, credit card reversal or the option to issue a voucher. Please also select if the item should be added back to your inventory (stock).